As I’ve mentioned, the antagonist as antagonist doesn’t come ‘on-screen’ until the end of the story when the detective reveals the murderer’s identity to the reader. In, say, an action/adventure story the reader knows who the antagonist is, at least in general terms. For example, in Raiders of the Lost Ark we knew from the opening sequence that Indiana Jones’ nemesis was René Belloq. Broadly speaking, there are two kinds of conflict—and this applies to any story, not just murder mysteries: There is conflict that spans the entire arc of the story (i.e., the main arc) and conflict that spans a minor arc (for instance, the B-story, C-story, etc.). The first kind of conflict lasts for the entire story and is often between the detective and her sidekick; I go into this further, below. The second kind of conflict is conflict that only lasts for a portion of the story. This portion could be a portion of a scene, a sequence of scenes, or the entire B-story/C-story/D-story, etc. I’ve covered the conflict within a scene elsewhere (see: Making A Scene: Using Conflicts And Setbacks To Create Narrative Drive) so I won’t go into that here. What follows has to do with conflict that comes from arcs such as the B-story, C-story, etc. How many conflict filled arcs are needed depends, at least in part, on how many murders there are: the more murders, the more suspects. For instance, in a show like Midsomer Murders where 3 or 4 people die, there needs to be a larger initial character pool than in a show like Murdoch Mysteries where, often, only one or two people die. In the main arc, the spine of the story, Murdoch teams up with the Captain to investigate the murder of an older derby skater, a person who coached girls, girls who later formed an aggressive derby team. That is the first major event. The second (usually either a murder or some sort of setback) is the victim’s daughter being knee-capped and crippled for life. In this episode the Captain acts as Murdoch’s sidekick. Murdoch’s goal is to find the killer as well as the girl’s assailant. He hopes that even if the girl’s assailant isn’t the killer it will help him identify the killer. But there is no quarrel between Murdoch and the Captain. There is a certain gentle push and pull but nothing remotely aggressive. That’s the main arc. The two sub-arcs are, first, Dr. Julia Ogden and Rebecca James’ rivalry with the derby girls (there is a minor arc having to do with their good-natured rivalry with each other over who is the better skater). The second arc has to do with the conflict between George and his new girlfriend, the reporter Louise Cherry. Who are the conflict characters? Which character generate conflict? I would say that the closest think to a conflict character is the derby team collectively. Here it’s not so much a person as it is a collection of people/characters. George’s conflict with Louise is a one-on-one conflict (since everyone else seems to love her!) while the conflict with the derby girls is between them and everyone else! What Sort of Characters Are Conflict Characters? Let’s talk about character roles. 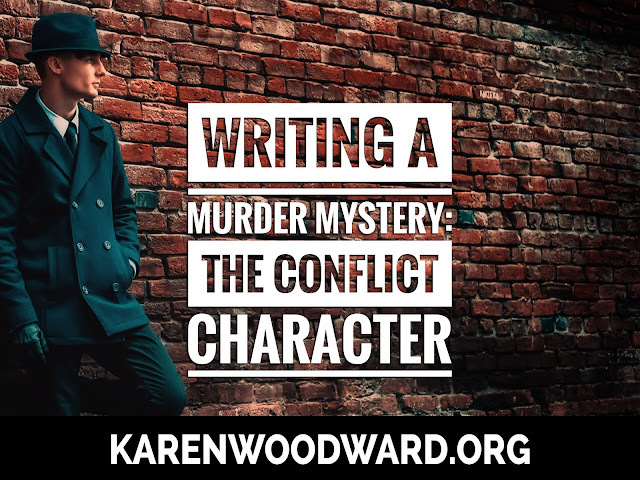 The conflict character could be the murderer, but most often isn’t. The conflict character could be a scapegoat, it could be a rival detective or even the detective’s sidekick. In what follows I’m going to explore each of these possibilities (see below) as well as give examples to illustrate what I’m saying. The scapegoat as a conflict character. A rival detective (or simply a rival) as a conflict character. The detective’s helper/foil/sidekick as a conflict character. I'll cover each of these in turn. Let’s look at Agatha Christie’s Peril at End House. (Note: In what follows I draw from the television adaptation starring David Suchet.) This conflict spans most of the story and is part of the main arc. Police representative/ally: Chief Inspector Japp. Note: Client lies to Poirot. This is the red herring. Conflict. As indicated, Freddy Rice is the conflict character. From the first time she comes on-stage she pushes back against Nick’s claims. The first time we meet her she calls Nick the most brazen liar but then softens this by saying she doesn’t mean it as a criticism. She views Nick’s ability to lie as a gift. Freddy claims Nick is lying about the brakes on her car being sabotaged. But Freddy doesn’t stop there. At various parts of the story Freddy contradicts what Nick says. Scandalous. For that time (the novel was published in 1932) Freddy was a scandalous character. She was married and yet carrying on a public affair with her lover, Jim Lazarus. And she is addicted to cocaine. As such, Freddy is not an especially sympathetic character! Just what one wants in a scapegoat. Let’s stay with the Queen of Crime, Agatha Christie, but this time let’s take a look at Murder on the Links. Again, I’m going to use the TV adaptation of the story starring David Suchet. Murderers: Madame Daubreuil (Mastermind), Georges Conneau/Paul Renauld (22 years ago), Marthe Daubreuil (present day). Police representative: Giraud of the Sûreté (Conflict character). Jack Renauld and Bella Duveen were a couple until Jack left Bella for Marthe Daubreuil. C-story: The relationship between Captain Hastings and Bella Duveen. Captain Hastings falls in love with Bella Duveen, but fears she is still in love with Jack Renauld and has murdered Paul Renauld. But, hey, every relationship has its problems! Although (as in any murder mystery) there is conflict between each character and the detective, the main source of story conflict (the A-story/arc) is between Poirot and Giraud. Both men consider themselves the greatest detective alive so there was bound to be a clash. Giraud, though, is a condescending bully who lacks Poirot’s grasp of order and method. Events come to a head when Giraud arrests Jack Renauld for the murder of his father. When the detective's helper is the conflict character the sidekick is usually somewhat bumbling, the detective somewhat acerbic, we see that they both have reasons for how they feel but they’re both likable, good and fair. I’ve already gone over an example of this, above, but let’s talk about Peril at End House. Here Poirot clashes with Hastings over the latter’s fanaticism over golf—he would much rather golf than help Poirot with the case—and this irks Poirot. Also, Poirot tells Hastings that his instincts about who is a good guy are so bad that if Hastings thinks a certain person is beyond reproach Poirot thinks they’re probably guilty of something! Hastings is, of course, offended. These minor clashes continue throughout the story. A story arc is the story's spine. It has to do with the characters, their goals, and the obstacles each encounters. In a television series the spine generally stretches over an entire season while the myth arc spans an entire series (not all series have coherent myth arcs, and that's fine; it's not necessary). In a murder mystery there are often two spines. One spine is what you would expect, the protagonist has the goal of discovering the identity of the antagonist/murderer and the antagonist/murderer has the goal of not being caught (or perhaps of doing whatever it takes not to be caught). As I've mentioned, it can be difficult to infuse conflict into this arc because the identity of the murderer is unknown. The other spine, though, often focuses on the protagonist's romantic interest. This story arc can generate conflict. While each episode will contain minimal conflict, when taken as a whole, generous amounts of conflict are supplied by the season-long romantic arc. For example, in Death in Paradise one story arc had to do with Humphrey engaging in what he thought would be a whirlwind romance with a friend on vacation but which turned into something deeper for both of them. I won't describe the story arc, but it has the traditional setup: each character has a goal and each goal is mutually exclusive. While each of them seems like a very nice person, they are each other's antagonist. It's effective. I think the TV show Supernatural (I'm currently addicted to it!) is the most successful at using both a seasonal story arc and its myth arc to generate conflict. Each season the brother's are in conflict over something. Further, this familial conflict is directly tied into the threat they're trying to save the world from (which, in turn, is tied into the whole myth arc about why they're doing this in the first place). We see that because the identity of the antagonist isn’t revealed until the end of the story, conflict in a murder mystery is often handled differently from other kinds of stories. That is, the other main characters, and even minor characters, help stoke conflict and keep the antagonistic fires burning. And of course the antagonist helps out by providing one or more murders for our intrepid detective to investigate. Being Poirot. This is an amazing documentary for fans (like me!) of Agatha Christie’s Poirot. That’s it! I’ll talk to you again on Monday. Till then, good writing! 1. Except when it isn't! In a murder mystery there are exceptions to this rule but they are so rare I'm not going to talk about them except to mention their existence. Example: The 10 season of Murdoch Mysteries. It seems as though George Crabtree's decision between Louise Cherry and Nina Bloom.